Sometimes bigger isn’t always better and that holds true for portable stainless steel grills. 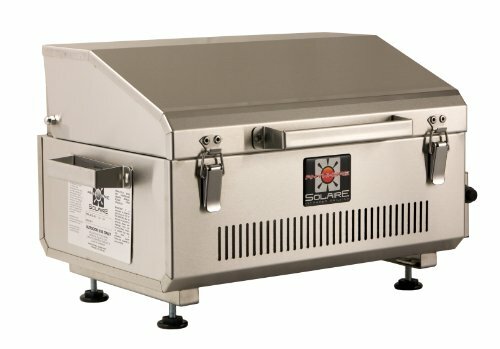 Think about it, no one wants to deal with hot lid handles, rust, redundant cleaning, and carrying a heavy grill for cookout. The Cuisinart CGG-180TS is ranked #1 on this list. The 5,500-BTU's per hour will be able to reach the entire 145-square inch surface so that your food can come out crisp every time. The folding legs are extremely sturdy and will be able to provide a reliable base to cook on. It will remain sturdy on any flat surface, including a table or a park bench. You can find this portable stainless steel grill in black, red, or the traditional silver. Cuisinart made it very easy to lock the lid on this grill. There is a button right above the temperature control that you can slide from left to right in order to lock the grill. 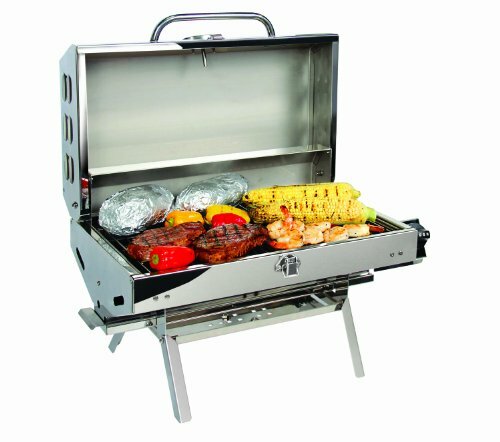 Overall, this grill provides users with portability and simplicity. You no longer have to feel hassled when setting up or cleaning your grill. 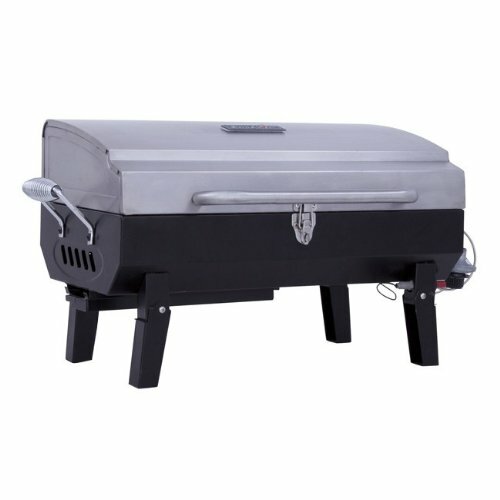 By offering what may be the most cooking space for a portable grill, the Smoke Hollow 205 comes in at #2 on the list. You get 305-square inches of room, so you can cook plenty of food at once without making people wait because the grill is too small. The stainless steel “U” burner releases 10,000-BTU's per hour, so your food will cook properly and fast. The temperature gauge on the top of the lid makes it easier to monitoring the heat of the food. The handle is also made of stainless steel, so you will be able to open and close the grill at will without burning your hand, because the stainless steel material is known to deter high levels of heat. Just because this grill gives you a lot of room to cook, doesn’t mean it isn’t portable. 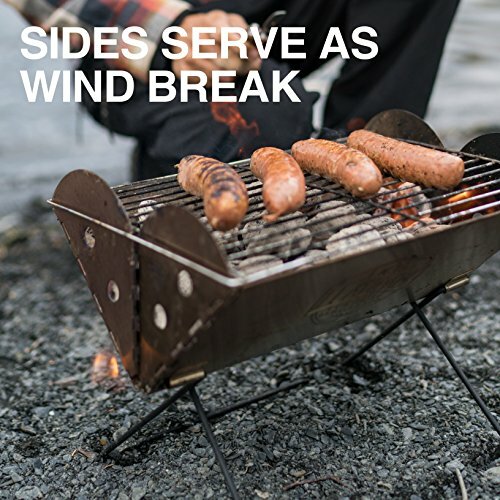 There are folding legs at the bottom of the grill so you can set it up basically anywhere; a tabletop, the patio, boat, or even the ground if you can physically cook while sitting or crouching down. When cooking time is over, simply fold the legs so you can store the grill. The lid also locks onto the bottom of the grill with strong stainless steel locks. This will make moving the grill from point A to point B fairly easy. This is a great grill to have if you like to go camping, to the beach, tailgating, or to the park. Unlike most of the grills on this list, this Solaire stainless steel grill is heated with infrared plates. This method of heating will evenly heat the cooking surface while preserving natural flavors and juices in your meats. With the electronic push-button ignition, you’ll be able to enjoy this experience first hand with a simple press of a button. The grill uses a one pound propane cylinder to cook, although you can use larger gas tanks with an adapter sold separately. This stainless steel grill releases about 14,000-BTU's per hour; enough power to cook for the whole family. You will get a true “portable” feel with this grill thanks to the side handles and latches. The grilling space is measured at 155-square inches, which is expected to fit about four hamburgers at a time. There are stainless steel grilling grids that are easy to clean, while keeping flavor and reducing the chances of unexpected flare ups. The grill also comes with a carrying bag, so you can easily carry it anywhere. The final advantage is the 1-year warranty, which protects you in the event that the grill stops working. The Camco Olympian 5500 is a lightweight grill designed for the outdoors. It is a great cooking tool to have, whether you are next to the RV, in the park, or in your friend's backyard. You will immediately notice this grills stainless steel frame, which will deter high levels of heat from making the lid too hot, as well as preventing rust. The 180-square inches of cooking space will give you just enough space to cook a variety of food, whether it is steak, chicken, hot dogs, or hamburgers. A unique feature is its cast iron smoker plate, which is meant to retain a majority of the meat’s natural flavors. You’ll also find a quick-connect hose that you can use to connect to an RV’s propane supply if you would like. There is a temperature gauge right above the handle, so you’ll always have an accurate idea of how long your food will take to cook. With heating power of about 12,000 BTU's per hour, whatever you’re cooking will have just enough heat behind it to cook properly, although some buyers have encountered issues with a lack of consistency when it came to heat. When using the Char-Broil stainless steel gas grill, you will have up to 200-square inches of cooking space to your advantage; enough space to cook for a small group of people. This grill is also easy to store and carry thanks to its folding legs. All you have to do is extend the legs when you are ready to cook and fold them away when you’re done! 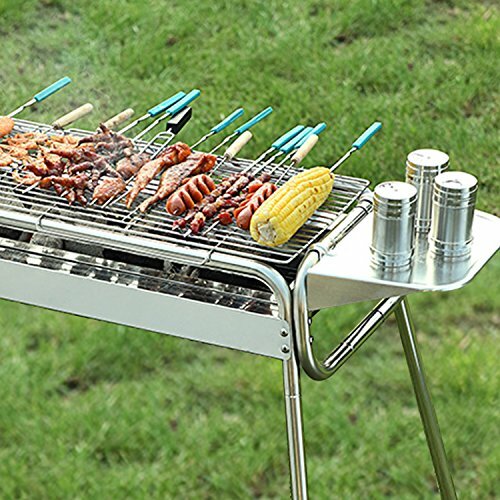 This portable stainless steel grill is powered by gas, so it will start up quickly. No need to wait for things to heat up when you can easily push the button for the ignition and get the grill going. Based on its size, this grill will be able to use a small one pound propane container, although it can also use a 20-pound tank if you purchase the adapter separately. The wire grates that you cook on are also made of stainless steel, so you won’t need to worry about the platform you cook on rusting up and becoming dirty. These grates are easy to clean as well, as long as you scrub with effort, just be careful of dropping food particles in the gas area, as it might cause a grease fire of sorts. 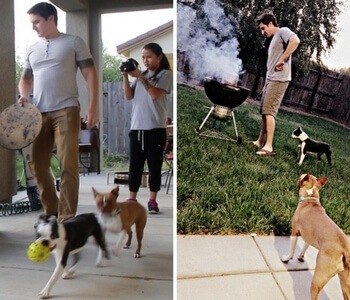 Having a portable grill means that you can move it around wherever you need to. That’s why the Char-Broil brand added heat-resistant handles. The metal latch that attaches the lid to the rest of the grill also promotes mobility; keeping food and/or ashes from accidentally falling out. 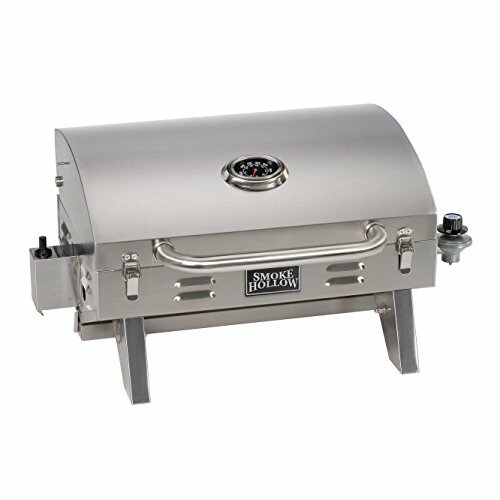 My personal favorite on this list, this is a very versatile grill at a great price. It folds up to almost nothing, and can be started relatively quickly with a small bit of wood or coal. 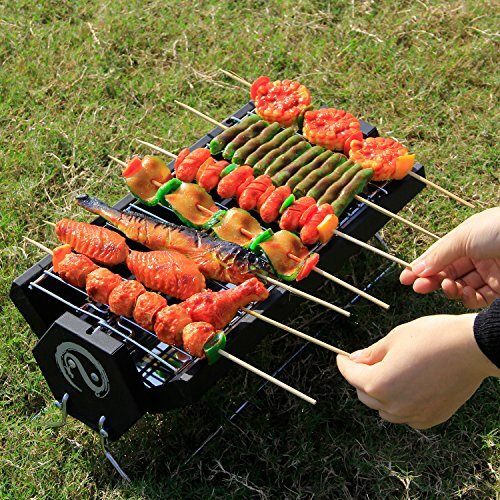 I'm a minimalist at heart, so this portable grill speaks to my aesthetic. The downside is that you need to carry fuel with you, unless you have that material at your camp site. Also, remember that some campsites in dry areas won't allow for open flames, in which case a gas grill might work better. Gas is also going to have the advantage on windy or snowy days. There are two versions of this product. One is 10×13-inches, and the other is 9×7-inches. That's tiny! It would be perfect for a personal or two-person camping trip. Another very, very portable grill comes from Wolfwise. This one is a bit larger than the UCO flatpack, clocking in at 15.7 x 7.9 x 5.9-inches. It also comes with a very cool carrying case, and you can roll this puppy up to carry on your back. How convenient! It only weighs 4.4 pounds, so it's lightweight as well. The design is pretty innovative in that has some air vents to allow coal to breathe. It's not a fully stainless grill like the others on this post, but it does have stainless parts, so it'll last you a long time. For such a cool design and with great reviews coming in, it's pretty cheap compared to similar models. The same brand as above, this is the larger version. Though you wouldn't want to carry this on your backpack, the lightweight design makes it easy to transport in a truck or RV. There are two height settings, either 30-inches or 12-inches. The 30-inch height is great so you don't have to crouch down to grill. This one also comes with “side wings” so your bbq sauce and other seasonings won't be left in the dust…literally. At 16-pounds, this stainless grill is definitely a lot more portable than its 100-pound cousin that you probably have in your backyard. While most, if not all stainless steel grills are nice and shiny, there are different ways to figure out which one is best for you. Needless to say, not all portable stainless steel grills are exactly the same, so the following info should help with your decision. Don't care about having stainless material? Check out our post on portable grills for camping or our separate portable gas and portable charcoal posts with more options. The grill’s legs are usually one of a handful of features that define the product as “portable.” Most of the grills on this list feature folding legs, that allow the grill to take up less space in storage – or in the trunk of your vehicle. Brands such as Smoke Hollow, Char-Broil, and Camco have legs with a small base, whereas the Cuisinart grill has legs with a wide base; enhancing the overall stability of the grill. Unlike the other grills, the Cuisinart CGG-180TS can be placed on an unstable surface and still manage to function. The grill that stands out on this list in the Solaire infrared grill. 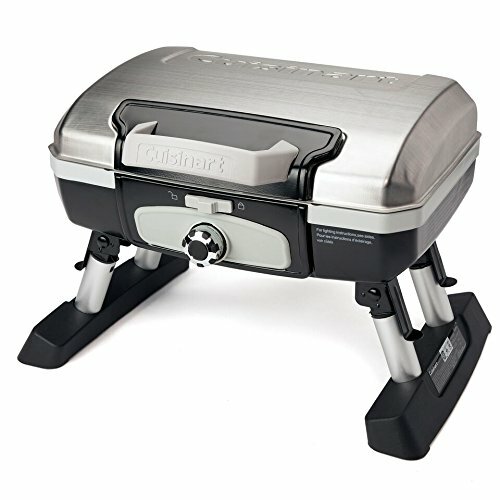 While the other grills have legs that easily fold, this grill has four small legs that keeps it stable while cooking. Although it might not be comfortable to transport, the infrared heating element will ensure that you have an evenly heated cooking surface. Everyone has their own reason for considering a portable stainless steel grill. Some go camping in areas where they typically move around a lot, while others are just looking for an outdoor grilling experience on their patio or balcony. A grill like the Solaire portable infrared grill is most likely the best for the outdoors. However, a tabletop grill like the Cuisinart CGG-180TS is a more versatile grill that has the ability and safety features to be used both on a balcony and in the outdoors. Something like the products Wolfwise offers would be perfect for the great outdoors, since they are lightweight, easy to clean, and work with charcoal/wood. Portable stainless steel grills can provide a lot more value than you would think. Trust us; there’s more than meets the eye! Let’s start with this question: what is a “portable grill”? A portable grill is essentially a cooking grill that is easy to transport. There are a number of different factors that determine if a grill is truly “portable” or not. This includes the weight, the type of gas it uses, and the type of platform used. Storage is always an important element to consider when purchasing any type of grill. Having a portable grill also means that it will be easy to store. A smaller grill means you can put it away in a closet, garage, storage unit, or even in a cabinet in your kitchen. No need to have an eyesore in your house as your grill sits next to your couch in the living room. Owning a compact grill means easy storage as long as you have the compact space available to you! Stainless grill stand out from the pack of other portable styles. These grills are typically easy to clean. Whether it’s barbecue sauce or a random seasoning, you’ll need to clean up the grates when you’re done. Luckily, you’ll only have to put in a minimal amount of effort when cleaning a portable stainless steel grill. All you’ll really need to clean your grill is wipe it down with a damp cloth. On top of being easy to clean, another reason why stainless steel grills are good to have is that they can handle high temperatures. When cooking food, things are going to become hot, fast. The last thing you will want to do is burn your hand on a hot part of the grill, such as the handle or lid. Stainless steel grills made with the right material will be able to handle even the hottest of temperatures, which will keep you comfortable as you are flipping your burgers. Finally, grills made of stainless steel are extremely durable. When buying a stainless steel grill, you aren’t just buying something that’s good for the summer or your friend’s tailgate party. These grills can last well over a few years, mostly due to its sturdy build. Stainless steel grills are also less prone to rusting, which is an appealing feature to have. Most people don’t want their grill to deteriorate, especially within a short period of time. Just like most products in the 21st century, if you take proper care of your portable stainless steel grill, you can expect it to last for a very long time. Having a portable grill will give you the ability to take it anywhere you please and the durable stainless steel material will ensure that your grill doesn’t rust easily!